I bet a lot of single women have subconsciously practiced that belief already. These women have been on their own for so long, work has become their first love. Work rarely leaves. In fact, you tend to leave work more than the other way around. Work gives you money and if you are in the relationship long enough, you will get benefits. Work will take care of you and insure you in many ways throughout life. Work also allows you to grow as a woman. He challenges you in ways that you can’t imagine. Push you to greatness and can even break you to pieces. Work is great to take with you during family reunions. Work will never embarrass you and when you are with work, people are actually happy that you have one. All of which sounds like the perfect healthy relationship --- which is the main reason why single women are usually working women. 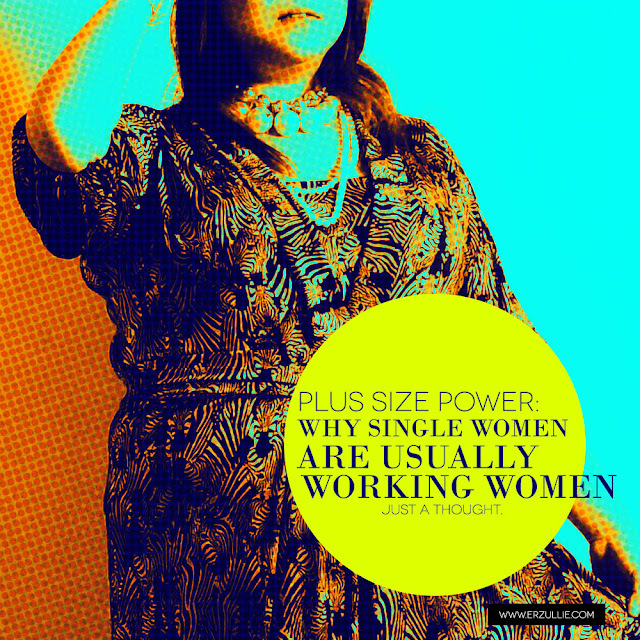 So that is why, I also find that single working women are always having a hard time finding a relationship. It’s not that they don’t want to. It’s just that they are perfectly happy and fulfilled with their current set-up that it will definitely take a “magnanimous force” to break that connection or at least a conscious choice of the woman to do so. Because they are already in a happy, healthy and fulfilling relationship --- why need one more?